After Barazani opened the doors of Nineveh and the occupied south of the Assyrian Triangle to the terrorist gangs, yesterday he announced that he opens the doors of volunteering for the Assyrians in the kurdish militia so-called "peshmerga", which supervise the occupation of Assyrian lands in all regions of northern Iraq, knowing that the kurdish occupation already published a call for Assyrians to hand over their weapons. 1- A threat to the Assyrians that the kurdish occupation is not obliged to "protect" (as they claim) the Assyrians anymore. This opens the doors to possible future assaults supported by kurds against the Assyrian towns, especially after the Kurds deliberately withdrew from the Assyrian and Yazidi areas to cause the largest number of victims in order to maximize the disaster and ask to be well armed. 2- Confiscation of Assyrian enthusiasm to volunteer in Assyrian factions to maintain security, and excluding the Assyrian arms under the kurdish command, taking advantage of the critical financial situation of the Assyrians who are displaced from their towns, and the world silence towards the kurdification policy. Assyria Patriotic Movement (APM), already warned about the demographic, cultural, and social kurdification policy, and now after the "ISIS" film started, an economic plot will break into Assyria by the American and other oil companies contracting with the kurdish occupation in Occupied Assyria. 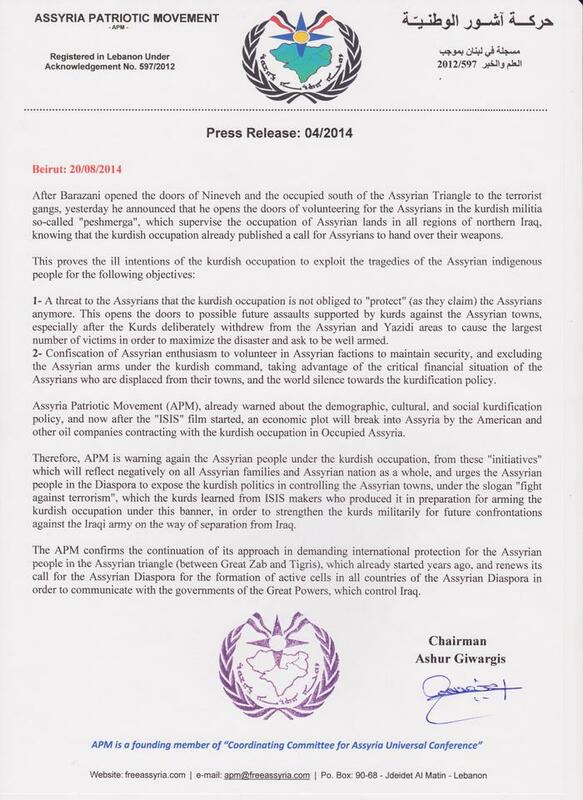 Therefore, APM is warning again the Assyrian people under the kurdish occupation, from these "initiatives" which will reflect negatively on all Assyrian families and Assyrian nation as a whole, and urges the Assyrian people in the Diaspora to expose the kurdish politics in controlling the Assyrian towns, under the slogan "fight against terrorism", which the kurds learned from ISIS makers who produced it in preparation for arming the kurdish occupation under this banner, in order to strengthen the kurds militarily for future confrontations against the Iraqi army on the way of separation from Iraq. The APM confirms the continuation of its approach in demanding international protection for the Assyrian people in the Assyrian triangle (between Great Zab and Tigris), which already started years ago, and renews its call for the Assyrian Diaspora for the formation of active cells in all countries of the Assyrian Diaspora in order to communicate with the governments of the Great Powers, which control Iraq.